Same comic uploaded years ago, but now with bigger&better scans of the stories. Comic Story (14 pages) The Ark of the Mist-Maids! Synopsis: The Wasumbas witch, Lutoa, is poisoning the chief so that her confederate, N'toba, can seize the chieftanship. Kaänga exposes her plot. 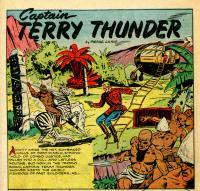 N'tonga is killed by animals captured for a funeral sacrifice and Lutoa is captured. Synopsis: A tiger, brought to Simba's jungle for cross-breeding with lions, escapes and proclaims himself king of the jungle. 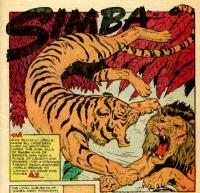 Simba attacks and kills him. Credits: Script: ? [as Ed Hunt] | Pencils: Richard Case | Inks: Richard Case ?; ? Synopsis: As Terry attempts to settle a border dispute between tribes, both parties are attacked by ape men, who are, in reality, disguised henchmen of Baron Lorne who has discovered diamonds in the area and wants both tribes driven out. Terry exposes the imposture and Lorne and his men are taken prisoner. Synopsis: A advertisement for novelty items and collectible stamps. Synopsis: Wambi and Sirdah are captured by a big game hunter who wants Sirdah as a prize and Wambi to help him entice other animals into traps. 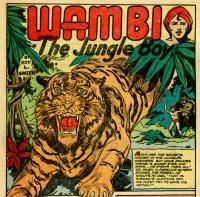 Wambi extracts a promise from Sirdah to only kill when necessary in return for helping him escape. Tawn and Ogg arrive and free them. Synopsis: The Aswengi witch doctor and his wife murder Chief Okuda and frame Tabu. Tabu tricks the pair into confessing with his illusions. Synopsis: King Cobra's gang is raiding pygmy funeral barges and taking sacred gold. King himself is beginning to feel remorse for the native killed in these raids. He attempts suicide but manages to only wound himself. He succumbs to amnesia and is befriended by Camilla. His gang seize him from her and plan new raids. Camilla promises to help the pygmies defend their barges. King warns Camilla about the coming raid, allowing her to prevent it. King recovers his memory and Camilla takes the entire gang to the coast and prison.